Review: "Paidarion: Hauras Silta" - Sea of Tranquility - The Web Destination for Progressive Music! 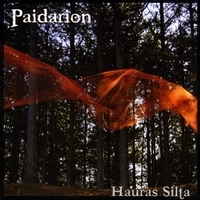 Formed in 2006, the Finnish band Paidarion have just released their first album called Hauras Silta. Billed as a band that plays gospel influenced progressive rock, I am not sure if this should be labeled as progressive. Some songs do have a heavy dose of gospel and I suppose there is the odd progressive element thrown into the mix. For the most part this is a pretty mellow offering with some moments verging on New Age. There are also folky elements and plenty of jazzy moments scattered amongst these twelve tunes. The female vocals, in Finnish, provided by Kristina Johnson are quite nice exhibiting a fragile beauty but I just wish the music presented was a little more up-tempo. Male vocals are provided by Jari Markkula. The music contains plenty of flute and various other woodwinds and the guitar is often presented as gentle electric and acoustic rhythms although there is the occasional guitar solo to be found. All around the musicianship is of high quality and the band are good at this style of music. The disc begins with the jazzy folk of the title track, featuring dreamy keys and a nice guitar solo. To my ears this one comes close to New Age territory. I prefer the more upbeat songs, whether it's the funky bass in "Oljenkorsi" which includes a pretty ripping guitar solo or the rocking jazz of "Kipinat Vedesta" featuring rollicking piano, melodic sax playing and another blistering guitar solo. My favourite song is also the most progressive. "Hahmo" features moody keyboards and synths and a wonderful guitar solo that fits under the progressive umbrella. While there are some nice moments to be had and the musicianship is tight with some pleasant melodies, I wanted a little more crunch. The band has the ability to really turn it up a notch when they choose which I hope they do more of on future releases. As it stands, those interested in the softer side of jazz/gospel rock and/or easy listening, with the occasional rocker, should probably check this out.